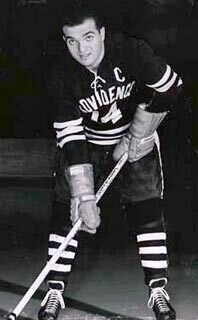 Lamoriello attended Providence College and captained both the hockey and baseball teams. When you consider the consistency of the New Jersey Devils' franchise since Lou Lamoriello took over as president in 1987-88, it has been the model of consistency. Up to 2009-10, the Devils have made the playoffs in 21 of 23 seasons, finishing first in their division on ten occasions and winning the Stanley Cup three times. 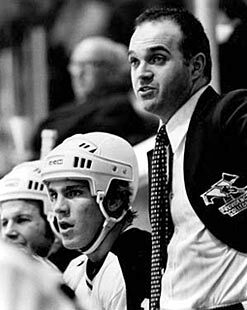 Louis Lamoriello was born October 21, 1942 in Providence, Rhode Island. Even as a boy, Lou was close to hockey. His father was a fishmonger in Providence, and got to know many of the local Providence Reds, an American Hockey League team. Young Lou got to know the players well, including the team's goaltender, Johnny Bower, and defenceman Fern Flaman. His own love of hockey was further fuelled by learning to skate in his hometown. "There was a pond across the street from our house," Lou reminisced. "I began skating with my brother. I was probably about 11." After attending LaSalle Academy, Lamoriello attended Providence College and in his senior year, captained both the hockey and baseball teams. He was a high-scoring forward while playing for the Providence College Friars of the ECAC. In 1960-61, he scored 11 goals and 20 points in 20 games. He scored 26 times and finished with 52 points in 21 games during 1961-62, and finished his college career with a 46-point season (21 goals and 25 assists) in 23 games. 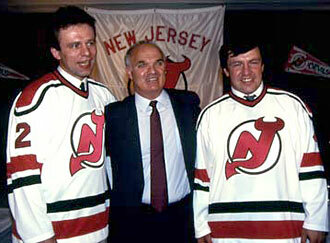 Lou Lamoriello along with newest members of the New Jersey Devils Viacheslav Festisov and Sergei Starikov. While teaching mathematics at high school, Lou discovered his calling when he served as an assistant coach of the men's hockey and baseball teams at Providence College. Four years later, in 1968, he was named head coach of the hockey team at his alma mater, and served in that role until 1987. Among those he coached were Brian Burke, now president and general manager of the Toronto Maple Leafs, Ron Wilson, head coach of the Toronto Maple Leafs, and Bob Nicholson, president and chief executive officer of Hockey Canada. Beginning in 1982, he also served as the school's athletic director. "The biggest decision had been to leave coaching to become athletic director," he admitted. "We had things going well. My whole world had been hockey." Lou worked morning, noon and night, putting his stamp on the school's athletic department. The Friars finished with a record of 33 wins against 10 losses in 1982-83 (the best record in U.S. college hockey) and appeared in the Frozen Four for the first time since 1964. A born organizer, Lou served as a member of the Big East Conference Television Committee and NCAA Professional Sports Committee and, along with his colleagues at Boston College, Boston University, New Hampshire and Northeastern, was one of the founders of the Hockey East Association, serving as Commissioner from 1983 to 1987. In fact, Lou did such a terrific job that the conference's executive committee voted to name the conference championship trophy in Lou's honour. 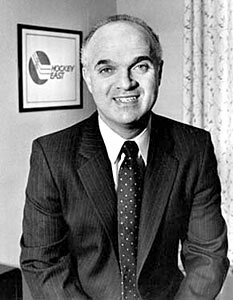 On April 30, 1987, Lamoriello accepted the position of president of the New Jersey Devils of the National Hockey League. One of his first moved was to add the role of general manager to his new portfolio. In his first season, the Devils earned their first winning season, winning 38, losing 36 and tying six. The Devils finished fourth in the Patrick Division, and with it, the franchise's first playoff berth. Since the franchise debuted as the Kansas City Scouts in 1974-75, through its reincarnation as the Colorado Rockies (1976-77 to 1981-82) and on to become the Devils in 1982-83, the team had never competed in post-season play. In his first season, New Jersey dumped the New York Islanders in six games in the division semi-final, edged the Washington Capitals four games to three in the division final and, astonishingly, went the full seven games before losing to the Bruins in the conference final. The Devils finished first in their division in 1987-88, 1996-97, 1997-98, 1998-99, 2000-01, 2002-03, 2005-06, 2006-07, 2008-09 and 2009-10. They won the Prince of Wales Trophy as Eastern Conference champions in 1995, 2000, 2001 and 2003, and captured the Stanley Cup in 1995, 2000 and 2003. In overseeing the organization, Lamoriello can also add another championship to his impressive hockey resume. In 1995, the Albany River Rats, New Jersey's AHL partner, won the Calder Cup championship. On three occasions, Lou has assumed the role of Head Coach of the Devils - once when coach Jim Schoenfeld was infamously suspended during the 1988 playoffs, another time from December 19, 2005 through the 2006 playoffs when Larry Robinson resigned and again from April 2, 2007 through the 2007 playoffs after Claude Julien was fired. 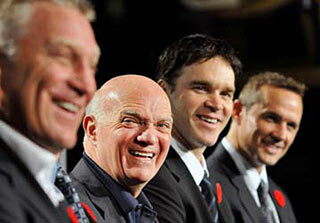 Inductee Lou Lamoriello sharing a laugh will fellow inductees at the 2009 Hockey Hall of Fame Induction weekend RBC Fan Forum. In 1996, Lamoriello served as General Manager for Team USA at the World Cup of Hockey. He was also General Manager of Team USA at the 1998 Nagano Winter Olympics. Lamoriello's accomplishments have earned him a number of prestigious awards, including induction into the Providence College Athletic Hall of Fame in 1982, recipient of the Lester Patrick Trophy in 1992 for contributions to hockey in the United States, winner of the 2000 Unico National Vince Lombardi Award for Professional Sports Achievement, he received an Honourary Doctorate Degree from Providence College in 2001, was inducted into the New Jersey Sports Hall of Fame in 2002, received the Ellis Island Medal of Honor in May 2003 and was inducted into the Rhode Island Heritage Hall of Fame and the LaSalle Academy (Rhode Island) Hall of Fame in 2004. 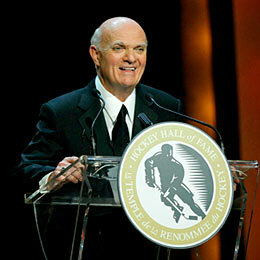 Lamoriello, inducted as a builder, makes his speech at the 2009 Hockey Hall of Fame Induction Ceremony. A veteran member of the NHL Board of Governor's Executive Committee and a member of the General Managers' Steering Committee, Lou played an integral role in negotiating the settlement of the 2004-05 NHL Lock-Out. 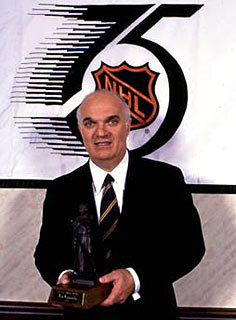 Lamoriello, the longest-serving current general manager with a single NHL franchise, was inducted into the Hockey Hall of Fame in the Builders' category in 2009. At the Induction Gala, he was joined by Brett Hull, Brian Leetch, Luc Robitaille and Steve Yzerman. Asked what makes a franchise successful, Lou stated, "There has to be a philosophy which you believe in yourself and not only preach, but practice. We have tried to put together a foundation and stay on track with it. Competency has to be there, loyalty, and I believe you have to have a work ethic to go along with those three things." He added, "And then you must get people who want to do the things that are necessary to have success unselfishly." Kevin Shea is the Editor of Publications and Online Features for the Hockey Hall of Fame.